The Franciscans first came to Athlone c. 1235 as the Normans gathered for the final onslaught on Connaught. The first friary in Athlone was established around 1235 on the site of the present Silver Quay complex (Northgate Street), possibly under the patronage of the Burkes, O’Fallons, and Dillons. There the friars built a church in honour of St Mary’s Assumption and it was consecrated by Archbishop Suerbeer of Armagh on 15 August 1241. Situated by the river to the north of the bridge, it was the only church on the Leinster side for 200 years.The friars were to move to several other locations during their continuous presence in Athlone over the following 750 years. The decades that followed witnessed Athlone’s gradual growth as an urban centre of English civilisation. It became a royal town of potential importance, both militarily and commercially. In 1251 the castle was renovated and the building of the defensive walls of the Leinster side was commenced by order of King Henry III. It is estimated that the number of friars in Athlone was around 16 at this time. They were able to combine effective apostolic work with prayerful seclusion. In choosing their first site the friars were motivated by two factors: availability to the people for pastoral services and enough privacy to ensure that their own life of prayer would not suffer. For this reason the church and the friary were outside but quite near the town limits. Easy communication would have been possible between the friars and the people through the nearby North Gate of the newly constructed defensive wall. Down the centuries the friars laboured in the diocese of Clonmacnoise. Thomas Quinn was elected bishop of the diocese in 1252. Eight other Franciscans held that office. The last bishop, Anthony MacGeoghegan, was ordained by St Oliver Plunkett. Friars also served as parish clergy, especially during the penal times. countryside. They continued to minister in secret from hiding places in Cloneskill, Kilmacuagh and Kilkenny West. Eventually they settled at Friars Island, Killinure. A path ‘Slí an Aifrinn’ connected the island to the town. Here Brother John Claffey was martyred during the Cromwellian persecution. 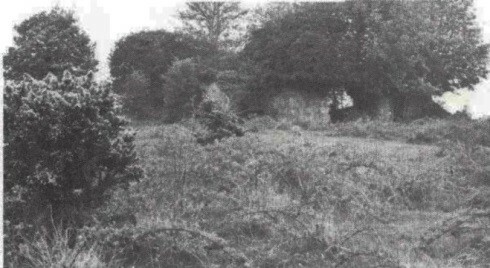 The ruins of a 17th century friary church can be seen at the old Abbey graveyard on Abbey road. When Friar John Farrell became parish priest of St Mary’s in 1723 he used the old chapel in Irishtown. The friars came to the present site of the friary about then. They opened a new church dedicated to the Immaculate Conception in 1815. This was demolished in 1930 to make way for the present church in honour of St Anthony of Padua. This Irish Romanesque church was opened in 1931 as a memorial to the Four Masters who began their work on the ‘Annals of the Four Masters’ in Athlone in 1628. For those familiar with the nearby Clonmacnoise ruins, the exterior recalls, in motif and design, the golden age of Celtic Christianity: the Round Tower belfry, the semi-circular recessed doorways, the central rose widow and the gable Celtic Cross. The stain glass windows come from the Harry Clarke studios and the Craftworkers of Dublin. The Clarke windows include: St Francis, St Louis of France (Patron of the Secular Franciscan Order), St Antony of Padua, St Elizabeth of Hungary (Patroness of the Secular Franciscan Order), and St Clare of Assisi. The Stations of the Cross (in opus-sextile) are by Ethel Rhind, while the opus-sextile work on the facade is by Catherine O’Brien. Over the main entrance there is the Last Supper, over the left aisle entrance the Sacrifice of Melchisedech, and over the right aisle entrance the Mass in Penal Days. In the apse there is a copy of the San Damiano Cross executed by Muriel Brant in 1975. 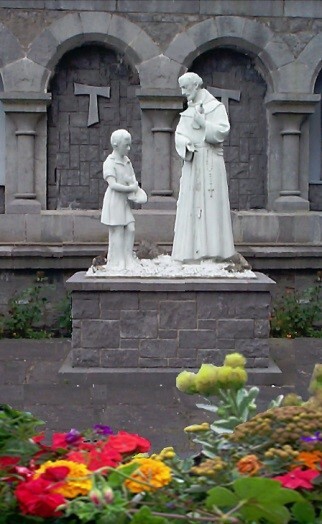 The following year, 1976, statues of St Francis and the Boy with the Doves were placed in the forecourt of the church to commemorate the 750th anniversary of the death of St Francis (1226-1976). This shrine was greatly enhanced in 1977 with the addition of a background ‘cloister’ of eight lime-stone Romanesque arches which came from the burnt-out ruin of Tipperary military barracks. Stones from each of the foundations are mounted in the apse of the church and a short history is to be found engraved in the ‘cloister’ area in the forecourt of the church. 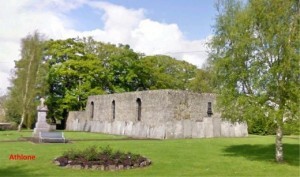 The original friary on the present site was started in 1812. The oldest part of the present friary dates from 1869.